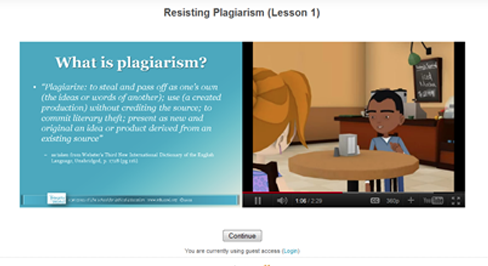 learn strategies to complete assignments with integrity. Research Support: The lessons follow the outline cited by Dee and Jacob (2010) where participation in tutorials substantially reduced the likelihood of plagiarism in a study of 1200 college students. Recommended Use: The E-Lesson is created for self-paced instruction in a homework assignment for students in grades 8-12. Teachers can assign the lesson and supply students with the necessary URL and login information for students to complete the assignment using their internet connection at home or in the school’s computer lab. Lesson Design: The lesson is presented in two parts on a link to SEE’s E-Learning Website. Each part includes a series of PowerPoint slides, which are narrated by avatars representing high school students. The avatars dialogue is highlighted in the PowerPoint slides. An avatar also notes questions that can be included within a quiz that students are to complete at the end of each lesson segment. The quiz includes ten-multiple choice questions and one short-answer response. Quiz questions and answers are shuffled so that no single student paper will be easily replicated by fellow students. Each of the two lesson segments should require less than 30 minutes to complete. Students will print out and turn in their quiz as a summary of their homework. ​Lesson Follow-up: After the quizzes are submitted, teachers are encouraged to reflect on the main points of the lesson with their students and affirm their own support for academic integrity and strategies to resist plagiarism.